I think every makeup collector should "shop their own stash" once in awhile, as a way of rediscovering and digging out items that they have forgotten. Electra was one of the very first shadows I ever bought from MAC (along with Vex) and my first pan has been with me years and years because I've worn it probably less than 10 times. It's a steely silver that has enough depth and sheen to still look dimensional when worn alone on the lids, while playing well with other colors. The main reason I haven't used this much in the past is probably because it's not exactly a subtle shade to wear on a daily basis. Beautiful it certainly is though. 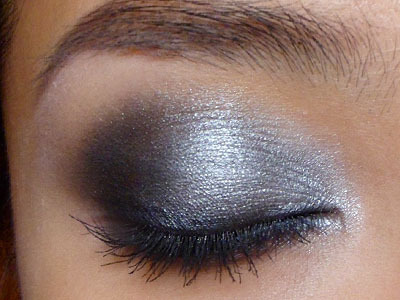 Step 1: First apply black cream shadow or base over your entire lid and along the lower lash line as well. This is a step that can help to intensify the whole look. 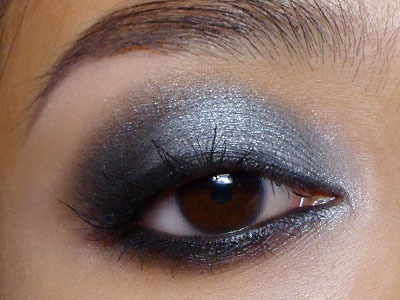 If you don't have black cream shadow, just use black pencil or kajal to get the same look. Step 2: Begin by packing the bright silver shade over the inner 2/3 of the lid, leaving just the outer corner and socket area dark. Step 3: Using a dark charcoal grey (if you don't have anything this dark, mix a black with the silver you used earlier) and apply that in the outer corner and along the lower lash line where there isn't any silver shadow. Step 4: Run black pencil or kajal along the inner rims of the lash line, and then use a flat angled brush to run black matte shadow along the upper lash line. This adds definition to the lash line. These 2 steps intensify the lash line without an overly-defined line that a pencil or liquid liner would give. Step 5: Finish by curling your lashes and applying black mascara. If your silver shadow has faded a bit by now, you can always touch up a bit more. Make sure you add a little silver to the inner corner of the lower lash line as well. This look works fab with softer lips and cheeks like nudes or soft pinks and peaches. I'd just avoid anything overly metallic on the lips since you don't want to distract from the strong-textured eyes. You CAN apply a strong red lip as well for a look that's a little more 70s/80s. Totally up to you!